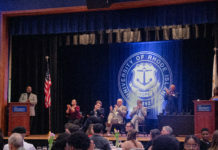 This December, the University of Rhode Island Dressage Team was denied $4,200 in additional funding from Student Senate to continue the lease on their horses for the spring semester. Without this money, the team’s coach would be forced to sell the horses and the URI Dressage Team would cease to exist. But that was last semester, and if the Dressage Team’s current members have anything to say about it, they aren’t going down so easily. Through a combination of fundraisers with local restaurants, their GoFundMe page and team members’ own out-of-pocket money, the team is working to stay afloat despite financial turmoil. It’s not for a lack of trying. Jones and the team’s president, Sam Govoni, have been consistently attending finance meetings to see if Student Senate will grant them additional funds to pay back their fees for taking care of the horses and competing, but haven’t been successful so far. This past Friday, the team asked for Senate money to fund their home show to get the chance to compete as a team again. Jones said that their problems arose last semester when the budget set for them by previous leadership was significantly less than what was needed for the team to operate. The team started with a Senate-allotted budget of $10,000, not even half of the $30,000 needed to cover the team’s expenses. Their increase in membership upped their costs, said Govoni, and by December, the team was out of money, even with bills to pay. “I would just like to say that nothing’s been decided yet and we’re still actively working with the Dressage Team to find a resolution to their current funding,” Cody Anderson, Student Senate finance chair, said. 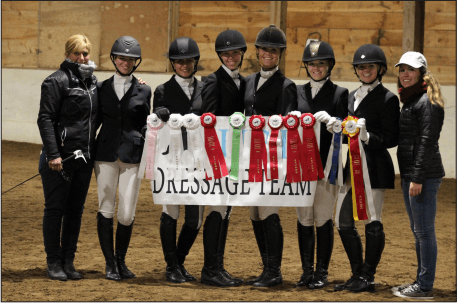 Elena Rittling, a sophomore member of the Dressage Team said that URI’s Dressage team, which is only about five years old, was a large determining factor in deciding to attend URI. Both she and her older sister, Nastasja, have been riding since they were kids and use dressage as a de-stressor. “Riding is my favorite sport, it’s 3-4 hours of forgetting everything,” Nastasja Rittling said. “When we’re forced to think about the money, it’s not relaxing anymore.” She feels that the reason Senate is less willing to give them funding is because they don’t understand what the Dressage Team does.